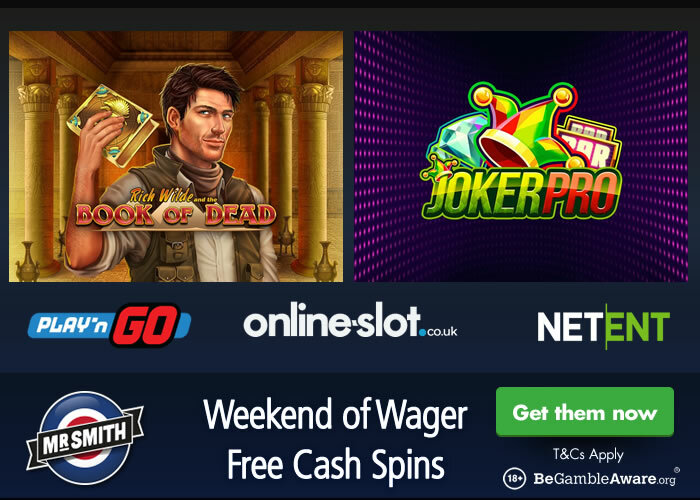 Mr Smith Casino have 2 promotions this weekend where you can get a total of 45 wager free cash prizes on 2 popular slots – these come with no wagering requirements whatsoever. Running today (Saturday the 15th of September 2018), you can get 30 wager free cash spins on Joker Pro. Head to the ‘Promotions’ section and click on the ‘Take Part’ button. Then deposit at least £30 to get your 30 cash spins on Joker Pro. Joker Pro is powered by NetEnt and comes with 5 reels and 10 paylines. Available to play from just 10p a spin on all devices, it has a futuristic feel and focuses on the Joker Pro Re-Spins feature. Here, the 2 outer reels (reels 1 and 5) transform into wild reels with 3 Hot Spot positions on the 3 central reels. If you see wilds on the 3 middle reels, you’ll pocket 1,000 times your stake. Read the Joker Pro slot review for more details. Running tomorrow (Sunday the 16th of September 2018), there’s 15 wager free cash spins available on Book of Dead. Similar to today’s promotion, you need to click on the ‘Take Part’ button within the ‘Promotions’ section. Then you need to deposit £25 or more to get your cash spins on Book of Dead. Now, if you enter the Free Spins feature, you’ll get another 15 cash spins tomorrow – that’s 30 in total. Book of Dead is a Play ‘N Go production with 5 reels and 10 paylines. With an ancient Egyptian theme, you join adventurer Rich Wilde on quest for lost riches. It’s all about the Free Spins feature where up to 20 free spins can be won. 1 symbol is randomly chosen to act as a special expanding symbol – this can lead to payouts of 5,000 times your stake on every single free spin! With over 1,000 slots to choose from, Mr Smith Casino welcomes UK players with a choice of 3 offers – you can get 25, 100 or 200 cash spins on NetEnt’s Starburst. With excellent customer support and fast cashouts, they have plenty of exclusive slots like NetEnt’s Fire Siege Fortress and Yggdrasil Gaming’s Trolls Bridge. They also have all the latest releases like Play ‘N Go’s Street Magic and Pragmatic Play’s Da Vinci’s Treasure.